In staying true to our love of bowl meals, we’ve got a new one for you! 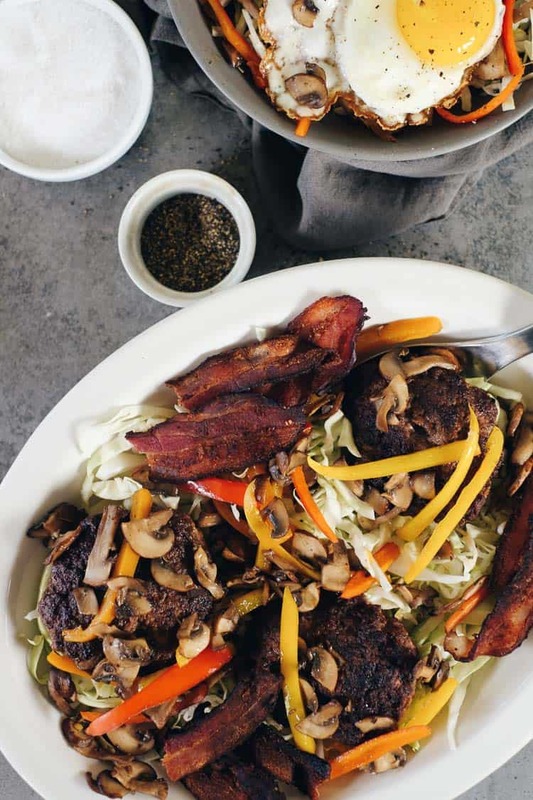 These chipotle beef Paleo burger bowls are another quick, 30 minute meal that you’ll love. They are a little spiced up from a typical beef burger, and the toppings are tasty and colorful! 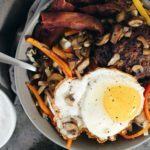 These 9 ingredient (including salt and pepper) chipotle beef Paleo burger bowls are an easy way to spice up your burger game! You can cook them up in a cast iron skillet on the stove, or during the summer you could grill them. 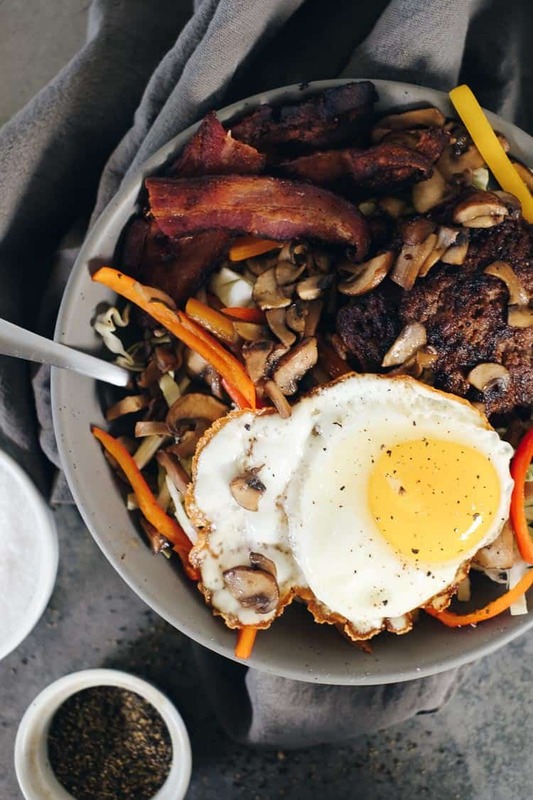 Either way, these yummy Paleo burger bowls will be ready in 30 minutes. We love bowl meals. For some reason sometimes things just taste better in a bowl. I think I mostly love how you can get a little bit of all the flavors in every bite, which is especially great with these Paleo burger bowls! You want to get a little bit of the peppers and mushrooms, along with the burger and egg. It all goes so well together! In our opinion, nothing makes a burger quite as complete as the addition of a runny egg. You can cook them however you prefer, but we recommend fried over easy, poached or soft-boiled to get a little runny yolk action going on. Just imagine the runny yolk cascading down the sides of the burger patty! 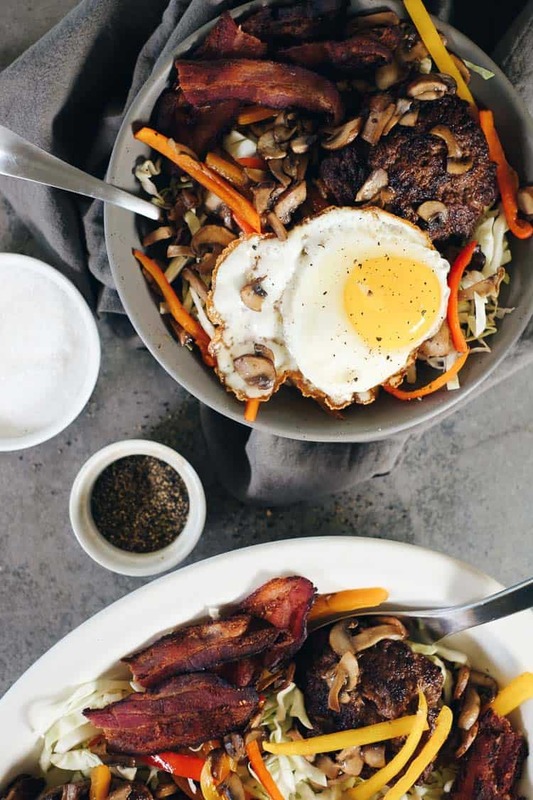 Go ahead and make these delicious Paleo burger bowls! They’re a tasty new spin on a traditional burger! Let us know how it goes by leaving a comment below. Also, take a photo and tag us on Instagram @realsimplegood, so we can check it out! 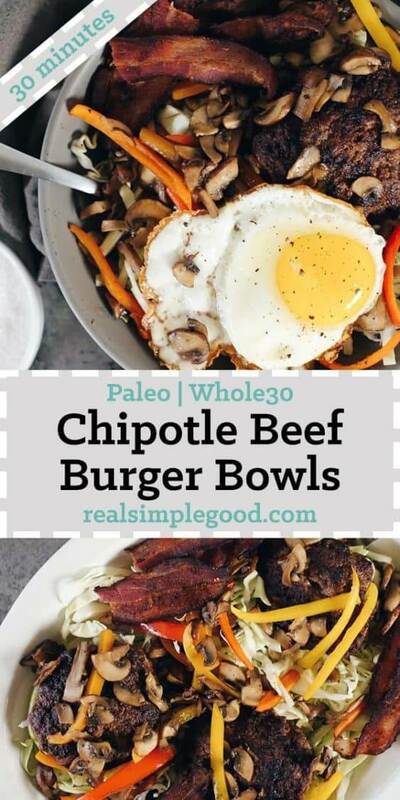 These chipotle beef Paleo burger bowls are a quick and easy meal you'll love. They're a tasty new spin on a traditional burger, with colorful toppings! Cut up mushrooms and peppers and shred cabbage. Set aside. In a bowl, combine ground beef with salt, pepper and chipotle powder and mix well. Form into 4 evenly sized patties and set aside. In a large pan over medium heat, add bacon to cook. Cook until almost crispy, about 8 minutes. Remove and place on a paper towel lined plate. Transfer some bacon grease to a separate medium sized pan to use to sauté mushrooms and peppers with. Leave 1 tbsp in pan for cooking burgers. In the same pan over medium heat, add in burgers to cook. Separately, in the medium sized pan over medium heat, add mushrooms and peppers to sauté, stirring occasionally. Sauté mushrooms and peppers until peppers have browned some and the mushrooms have cooked down quite a bit and then turn heat down to simmer. Meanwhile, cook burgers about 4-5 minutes per side for medium burgers (or more if desired) and then remove from heat. Finally, cook eggs in a small pan to your desired state. 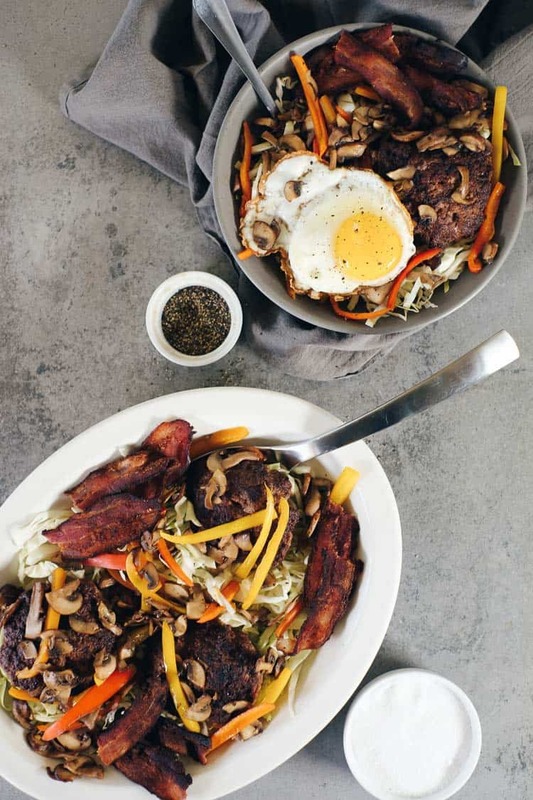 Serve in bowls with a base of cabbage topped with a burger, mushrooms, peppers and egg.